Quantum Leaps #8-11: Figurative Beadwork and Thematic Content — Valerie Hector Designs, Ltd. In this post I'll discuss three examples of figurative beadwork from the tomb of King Tutankhamun, all worked in what appears to be peyote stitch. First, a pair of sandals. Tutankhamun was interred with many pairs of sandals (see G.M. 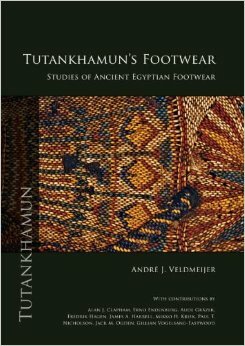 Vogelsang-Eastwood, Tutankamun's Wardrobe: Garments from the Tomb of Tutankhamun (, pp. 68-77 or Andre J. Veldmeijer, Tutankhamun's Footwear ). One of the most interesting pairs is covered with netted beadwork featuring images of papyrus and lotus motifs rendered in what looks like 2-dimensional peyote stitch, beautifully contoured to fit the shape of the leather soles. In ancient Egypt, lotus and papyrus motifs symbolized the union of Upper (northern) and Lower (southern) Egypt into a formidable political entity. Thus, we have a combination of Quantum Leaps #8 and #9 - Two-Dimensional Figurative Beadwork and The Integration of Thematic Content. The straps of the sandals are worked in a tubular bead net over a leather core, in a spiral pattern that evokes "the dom palm strip on a basketry sandal" (see Tutankhamun's Wardrobe: p. 74 and Fig. 4:37). The straps are embellished with symmetrically contoured floral motifs in blue, yellow, red and white beads. Beadwork sandals of King Tutankhamun (ruled ca. 1332-1323 BCE) showing lotus, papyrus and dom palm motifs. While the technique is probably peyote stitch, the materials are faience beads and leather. The sandals are preserved at the Egyptian Museum in Cairo as Catalog General No. 85 a-b. Image courtesy Egyptian Museum, Cairo. Tutankhamun was also buried with at least two beaded hassocks (small pillow-like objects, possibly used for resting the feet) consisting of circular bead net panels over linen-covered rushwork cores. 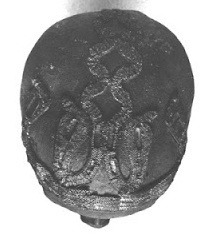 One of the hassocks is especially important for the history of figurative beadwork, for it features the earliest surviving representation of the human figure in beads - another example of Quantum Leap #8. This representation required knowledge of asymmetrical contouring - unevenly increasing and decreasing the number of beads per row to follow the outlines of a motif - an example of Quantum Leap #10. Although we see evidence of contouring in the sandals shown above, it seems to be largely if not wholly symmetrical in nature. Above - one of the beaded hassocks found in the tomb of King Tutankhamun, yielding the earliest known renderings of the human figure in beads, ca. 1332-1323 BCE. A common motif in King Tut's day, the figures represent the African and Asiatic enemies of Egypt - one of the earliest surviving examples in beadwork of thematic content, in this case, of a sociopolitical nature. The technique looks to be one- and two-drop peyote stitch. The hassock is preserved at the Egyptian Museum in Cairo. Image courtesy Egyptian Museum, Cairo. Two human figures are depicted on the hassock in one of the circular bands that structure the beaded surface. It is instantly apparent that the figures occupy a subservient position, for their spines arch starkly backward and their limbs appear to be bound. That their poses are simultaneously static and dynamic only heightens our discomfort at the scene before us, as fascinating as it is disturbing. It's almost as if the figures are rotating around the center of the hassock, yet the bodies look so rigid. King Tutankhamun himself might have felt no such discomfort; enemies had to be quelled so that Egypt could endure. The two human figures are thought to depict a stock motif in King Tutankhamun's day: Egypt's African and Asiatic enemies. Together with the sandals shown above, the hassock provides one of the earliest surviving deployments of sociopolitical content in beadwork, which this case serves to assert Egypt's supremacy over foes near and far. For sustenance in their efforts to maintain personal and political superiority, Egyptian kings turned to the cobra goddess Wadjet. Kings wore depictions of Wadjet on their regalia (see Tutankhamun's Wardrobe, p. 36). In fact, Tutankhamun's mummy was found to be wearing a linen skullcap embellished with four beaded cobras, heads reared in readiness to strike. Most of the linen has disintegrated. However, this may be the earliest surviving example of religiopolitical imagery in the history of beadwork. Remains of the beaded cobra skullcap on the skull of Tutankhamun, made of faience beads, linen (now largely distinegrated) and gold cartouches. Image courtesy Griffith Institute, Oxford. With this discovery, freestanding bead net motifs could be appliqued to almost any pre-existing textile - or to other surfaces. Because the beads were netted densely together, I believe, the cobra motifs survived the millennia intact. Had the beads been stitched individually to the linen, they would likely have scattered as the linen disintegrated. That the three splendid objects shown above could yield four Quantum Leaps proves that beadwork was maturing as a medium during the 14th century BCE. One assumes that beadworkers were building on advances that had already taken place within or beyond Egypt - while developing further advances of their own. From this time on, there is no subject that beadwork cannot address. It will not be long before Egyptian beadworkers express thematic content via the written word, in other words, by depicting hieroglyphs in beads. While this development is important, I do not see it as a Quantum Leap of its own (although I may change my mind one day). *I am unsure whether to consider the "tail" on the Beaded Apron of Senebtisi, which was discussed in Quantum Leaps #6-7, as an example of figurative beadwork. I need to do more research.